This is our review of the popular Black and Decker ST4525 Grass Strimmer. 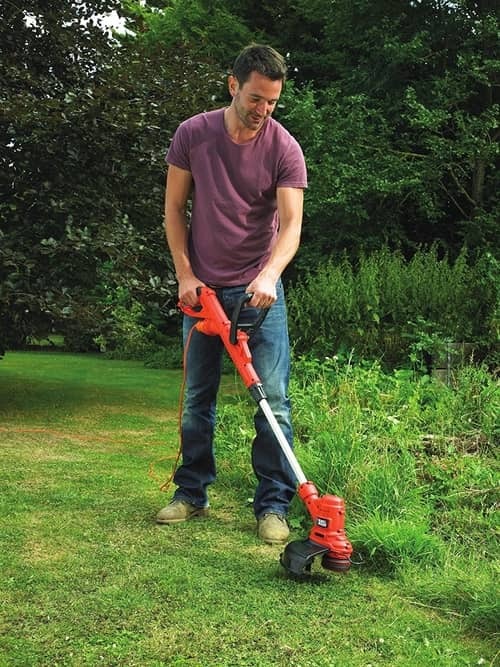 This strimmer is relatively new to the UK market, but with its 450 watt motor and a price point of around £50-55, it is proving a popular choice for many UK buyers. In this article we take a closer look at this strimmer, and hopefully our research will help you decide if this is the best option for you. At the moment buyers rate this strimmer with an 80% buyer satisfaction, always nice to see a buyer rating in the high 80's. This is a lightweight corded strimmer that comes with a spool and line so as you are ready to start strimming when the product arrives. In this section we check out the actual specification of this ST4525 model and see what benefits there are for potential buyers. High torque gear system - the power from the motor above along with the high gear torque system is what really makes the difference in this one. The gears working in combination with the motor drive a lot of power to the head of the strimmer, and that is exactly where you want the power to be. As you can see this trimmer gets a good rating, and that is always a very good sign. We have then collected and analysed what buyers actually had to say after they had bought and used the product. We have then put this information together in a pros and cons table which you can find just below. Buyers say that this product is quick and easy to assemble. One or two people mentioned that the blade guard could be a little hard to attach, as you have to snap it pretty hard into place. A few buyers said they thought the lead was too short, but like all these strimmers, the lead on this is the same as any other. Many gardeners find the leads are never long enough and they use an extension lead. It is always good to see a high rating on any product and this strimmer is up there with the rest of them. At 80% that is relatively high for this type of gardening tool. 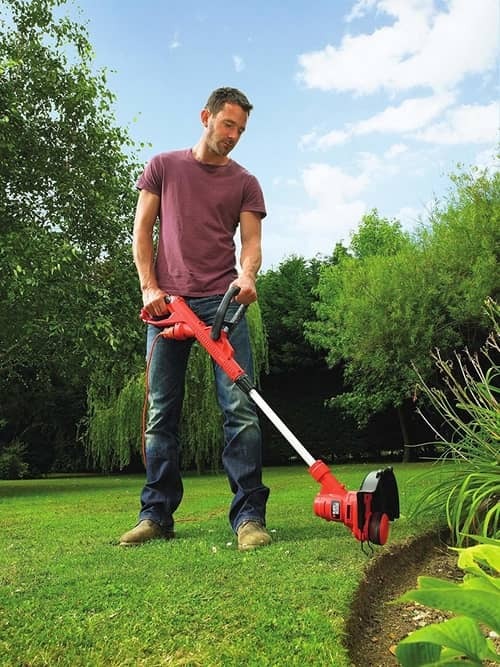 Buyers say the strimmer looks and feels good in the hand and at around 2.5 kg it is also light and easy to use. For us the plus points are the feed system, and the fact that it cuts well even on long grass and tougher weeds. 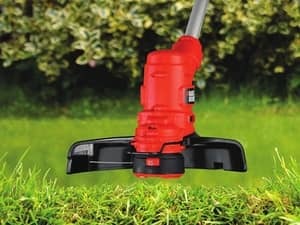 Black and Decker make a number of these strimmers and this is one that they have priced at a sensible price point. If this is not the model for you, then check out our top 10 list of corded grass strimmers, to see if there is one more suitable for your needs. This model is an automatic feed system that you tap to release. The majority of buyers did say that they have no problems with the line getting tangled. Some buyers didn't like the fact that it feeds line when started up after being stopped. This is both a good and bad thing as I appreciate it can waste line. On the other hand you always have line to work with, and don't have to do that manually. It's like marmite, you will either love it or hate it. In summary this one is fairly priced and we would class this as a middle of the range strimmer, that currently sells pretty well in the UK.